Get frequent updates from the Honors College. 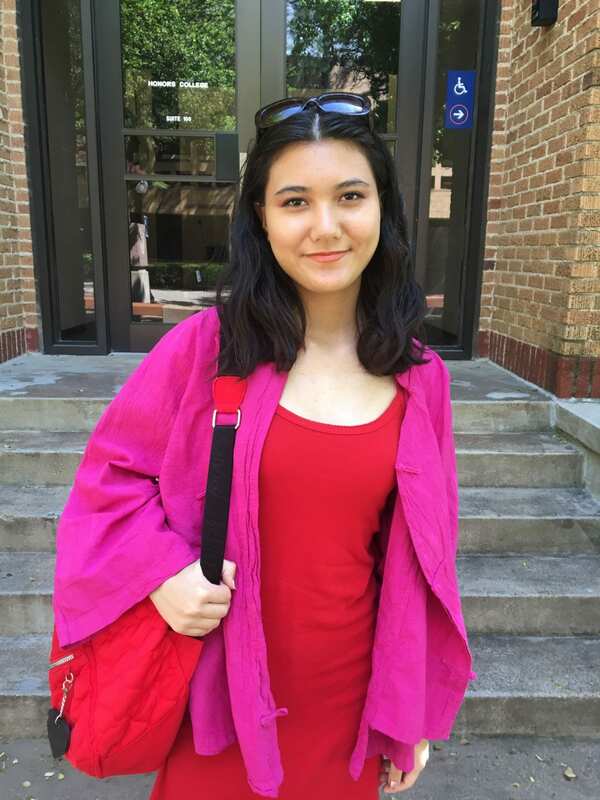 Today we’re shining a spotlight on Interdisciplinary Studies sophomore, Mimi Burnod! 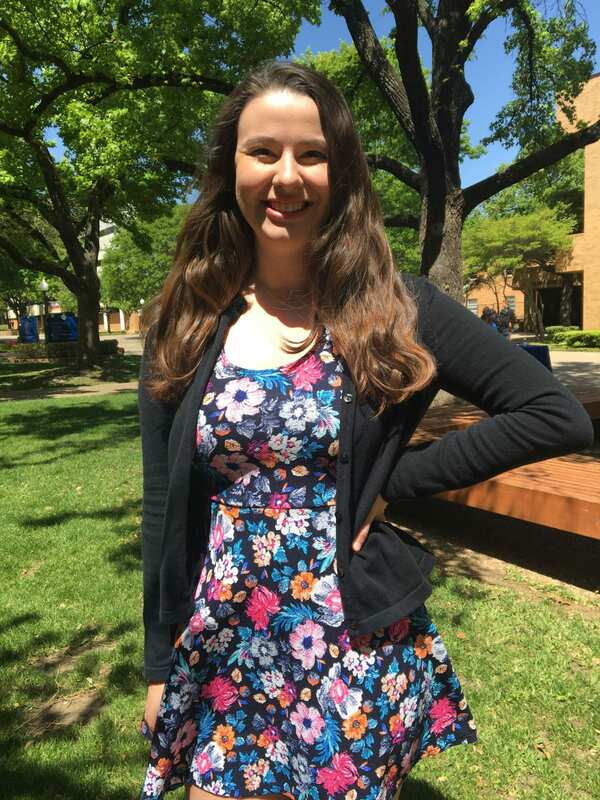 Burnod is a Resident Assistant at West Hall, and former UTA Ambassador and Student Senator. She’s from Houston, TX, and is half-French, half-Taiwanese. Mimi Burnod stands outside College Hall. MR: Tell me about your experience as an INTS major. MB: Basically, my sister – she went to UT Austin, and she did a similar program where you design your own degree plan. So when I learned about that, I found it really interesting. I thought to myself, when I go to college, I want to see if they have a program like that. When I came here, at the orientation there was actually a table for INTS, and that’s how I learned about it. But in the beginning, my major was Art History, because that’s something that really interested me. 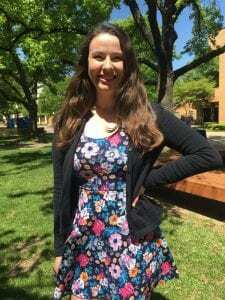 But then I realized that I wanted something more personalized to my specific goals, so then I met with Rebekah – I think it was the end of my first semester at UTA, and right away I knew… I [wanted] to change my major to INTS. Rebekah helped me so much to design the degree plan. MR: With INTS you minor in different things. What are your specializations? MB: My tracks are in Theatre, Dance, and French. MR: Do you have any goals for the rest of your time as an undergraduate? MB: Right now, I’m in the Maverick Dance Company… We do a show every semester and we have different pieces that are all choreographed by the students. So right now I’m just dancing in it, but one of my goals is to choreograph a piece for the show. MR: I know it’s kind of far off, but do you have any goals for after graduation? MB: Of course, yes. My interests are in Dance, Theatre, of course, and then the French culture and Art History. I have so many different career goals, but one of them is to teach dance… another one of my goals is to write books. I love to write; I love to write poetry, but I would want to write fiction and nonfiction, as well, and write about my experiences as a dancer, all the life lessons I’ve learned through dancing, and what it means to be an artist. MR: Tell me about your upcoming trip to Paris. MB: I’m really excited about going to study abroad in Paris, and I think it’s really amazing that we’re able to do that with UTA, so that I can have this experience but it’s still going towards my degree. The really cool thing about it is that I’ll be able to take dance and acting classes at a conservatory and have those credits count towards my degree. Paris is very famous for the arts, all the art history, the museums, so I’m really excited to learn about that. To be able to go in person and see the paintings and the statues in the museums that we study about, not just seeing the picture in the textbook – I think that will make the learning experience a lot more meaningful and interactive. The #HCSS spotlight this week is shining on Sarah Ruthven, a Microbiology senior from League City, TX! Ruthven is a MavElite Tour Guide, former Orientation Leader, and VP Recruitment Information in Alpha Chi Omega. Sarah Ruthven poses outside College Hall. MR: Tell me about your experience being a Microbiology major. 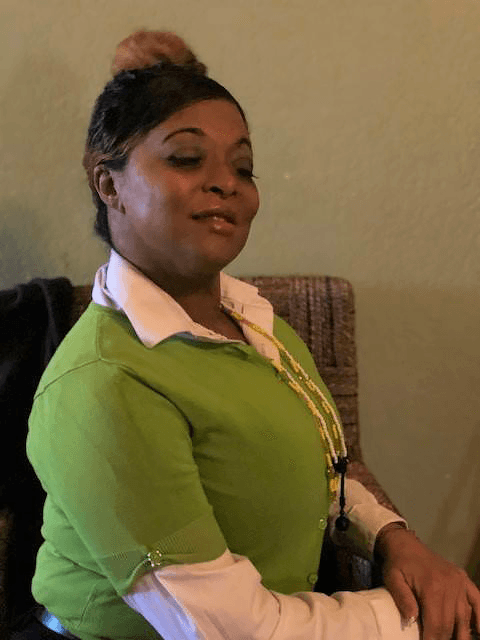 SR: Originally I started off as a Nursing major, and then I found that all my friends were like, “I want to help people,” and that was not what drove me. I realize that could be bad, but I really want to help society from afar, not the individual. So I had taken Microbiology, fell in love with the course, and then decided to change my major to that. Originally, I thought I would go the healthcare route, and do more in medicine, but after taking some classes I fell in love with the environmental side. Limnology is probably one of my favorite classes; environmental microbiology was also really cool. So, bioremediation, using microbes to clean up oil spills, that kind of thing really drives me. MR: What has your experience been like in the Honors College? SR: The Honors College has been fantastic to me. For my first two years, I was a part of the Learning Community in Vandergriff Hall. I was [in] the guinea pig class for that, it was awesome. I always advocate for that when I’m on tours as well. I got to meet a lot of really great, substantial people, both peers and faculty. That’s just really shaped my college experience, and I couldn’t be happier with it. MR: What are your goals after graduation? MR: How has the Honors College affected the way you attain those goals? SR: The Honors College has really pushed me to strive for the very best in everything that I do. It’s also pushed me to reach out to my professors and make contact with them, as opposed to being the afraid little freshman in the front – actually going up and talking to them. I’ve made a lot of what I would think are friends that way, so definitely understanding how to put yourself out there is fantastic. MR: Imagine it’s your first day at college as a freshman. What advice would you give yourself? SR: To sit back and enjoy it. Don’t rush it. Enjoy your freshman moments, because as soon they’re done, you’re not getting them back. MR: Tell me about being part of your sorority. What is that like, being the VP of Recruitment Information? SR: I didn’t rush my freshman year. I waited a year because I never, ever, ever thought I’d be the sorority girl. My mom went to UT and back when she was there, it was a totally different environment than what it is here. After my first year, I saw my roommate go through the process and she fell in love with it. She had great, real friends. They weren’t all like, “Oh my God, glitter and nails!” …I found that they were real people, and that’s where I found that a lot of the leaders on campus were involved. So I was like, “I want to get in there,” because I was really involved in high school, so it was an easy magnet for me. It did take a couple semesters for me to become a leader in the position that I currently am. But now that I’m in it, it’s a lot more than I ever thought it was. I’m definitely in the right spot. [In] my position, I get to do research on the potential new members – AKA, stalk them on all the social media and then make a database about it. So it’s a lot of things I never thought I would be doing, and my first year of recruitment, I was like, “Oh my God, this is so much. Gross.” But now I’m head of it, so that’s pretty cool. This week’s #HCSS shines a spotlight on Kenya Loudd, an Interdisciplinary Studies junior from Ft. Worth! Loudd is a McNair Scholar. MR: Tell me about being accepted to the McNair Scholar program. KL: I was excited about it because research is the path that I want to take – research and professorship. So I was excited about it because it gives me an opportunity to get paid to do what I like to do anyway, and then prepare me to do it on a larger level than I’ve done it at before. And also to be able to present, and go to conferences, and things like that, so I’m very excited about it. MR: You mentioned research and professorship. What are your goals after graduation? KL: After graduation I am planning on enrolling in the Mind, Brain and Education master’s program here… and then getting a doctorate in Education. And like I said, I would like to be a professor. Ultimately, I would like to teach outside of the country. It may be [helping] form some schools in some impoverished areas around the world, particularly South America and Africa. MR: Has the Honors College affected those goals? KL: I think because I came in as a transfer student, that was really locked into my vision before I came in. So if anything, the Honors College has, with the extra workload…prepared me for what’s to come. MR: What is it like being an INTS major? KL: It’s fun because you get to do more than one thing at a time. So for instance, this semester, I start my day with Diversity Organizations, and then I go to a Black Families class, then I leave there and go to Intro to Social Work, and I end the day with Leadership Theory. So it’s like a splash of everything in a day. It’s not mundane, I’ll put it that way. It keeps my attention in a lot of different areas – and, not only that, what I’m studying allows me to see the intersectionality between all these things and look at them in a bigger picture, as opposed to if I was just studying one of these fields all by itself. I might not see how it all connects the same way. KL: African American Studies, Disability Studies, and Leadership Studies. MR: If you could give someone who’s just now entering college any advice, what would it be? KL: Prioritize, that’s the biggest thing. Prioritize about what’s important and what’s not. Map out what your vision is. I know when you’re first starting, a lot of people – it’s probably different for me, because I’m older – but I actually have a 17-year-old daughter who’s getting ready to enter college in the fall. So what I tell her is, “Focus in, see what your interests are and explore them. Research, do your own outside research. Find a mentor, find someone in these different areas, even professors, and form a relationship with them, and really get to understand what it is that they do and the field that they’re studying. And then when you figure out what works for you, map your plan out and work your plan. MR: What has been the most significant moment or accomplishment so far as a student at UTA?